Fun improving waves across both coasts on Saturday morning with easing surf from 2ft+ on the Surf Coast and 3-4ft on the Mornington Peninsula with variable tending offshore winds ahead of sea breezes. Sunday was small to tiny and best on the exposed beaches to the east before a strong change moved through, creating poor surf into today. Now that a surface trough has moved in from the west (bringing yesterday's change), a strong high is filling in behind it, bringing onshore winds that will slowly swing anti-clockwise though with no significant swell. 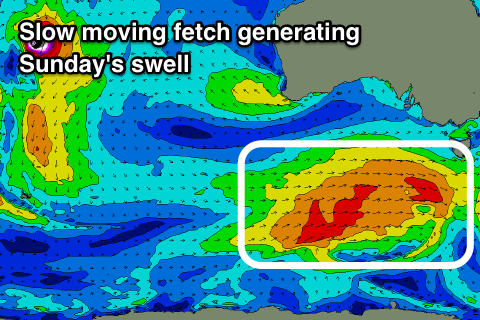 A long-range and inconsistent SW that's currently in the water under the onshore mess is due to peak this afternoon to 2-3ft on the Surf Coast and 4-5ft on the Mornington Peninsula. We'll see this swell easing through tomorrow from a similar size though conditions will remain a mess with a moderate to fresh S/SE tending strong E/SE breeze. Strong E/SE winds will also develop through Bass Strait, persisting into the evening and swinging more E'ly into Wednesday, kicking up a moderate sized E/SE windswell for the Surf Coast and peaks across the Mornington Peninsula as well. The Surf Coast will likely see solid 4ft surf Wednesday morning, easing off through the day, while the Mornington Peninsula will be a bit smaller and easing from 3ft to maybe 4ft with a mix of weaker mid-period S/SW swell in the mix. Winds will tend more E/NE on Wednesday morning favouring the beaches to the east while the Surf Coast will remain a junky mess. Thursday should become cleaner on the Surf Coast with a light N/NW breeze, likely N/NE on the Mornington Peninsula, but size wise there'll nothing of note with fading 1-2ft sets on the former, and 2ft to maybe 3ft waves on the later. A new mid-period SW pulse due Friday morning isn't expected to have much size attached to it, with a pre-frontal and south-east dipping fetch of W/NW winds generating it today and tomorrow. The Surf Coast may see 1-2ft sets, with 2-3ft waves on the Mornington Peninsula but with freshening SW winds (possibly W'ly early around Torquay). The front isn't expected to bring any new swell but a stronger system firing up behind it will do into the weekend under the influence of a strengthening and stalling node of the Long Wave Trough across the south-east corner of the country. This front will develop in the Heard Island region mid-week and generate a broad and elongated but relatively weak fetch of strong to near gale-force W/SW winds along the polar shelf and then up towards Tassie through the end of the week and Saturday, across us Sunday. The front will be slow moving helping to generate more size than would normally be seen, but the swell will consist mostly of mid-period energy. We may see a late increase in windswell Saturday, but Sunday looks to offer the peak in swell with building sets to 3-5ft on the Surf Coast and 6-8ft on the Mornington Peninsula. A secondary weak front projecting up towards us while strengthening will tip winds W/NW on Sunday morning, likely holding out of the W most of the day if we're lucky. This secondary strengthening front will likely produce another increase in swell for Tuesday but with less favourable winds, with Monday falling in between swells with a morning W/NW breeze. More on this Wednesday though. Can anyone tell me why can only view forecaster notes on web page? Is it not not a feature on the phone app? You're correct, the FC Notes aren't in the App. It wasn't in the initial design spec. Why? Because of the way we perceived the Apps would be used, compared to the website (same reason the forums and article comments also aren't in the App) - at the time, we thought users would prefer to consume long form content on a desktop computer, and use the App only for short, timely information like surfcams, latest winds, surf reports etc and just a quick forecast overview with the graph. Looks like we got our assumptions wrong. Though, the App was spec'd up quite some time ago - perhaps 5+ years? And things were quite different back then. And they'll be much different in another 5 years time too. Yep, we want the FC notes in the App too - but we're completely overhauling the Apps, so it'll be available once we get that done. Until then, you're best off using the website (which currently works better than the App right now anyway, IMO). Thanks for the reply. Definitely noticed the app is a little out dated and the website is just as good or better, still I use it because it keeps me logged into my account where as the web site, although saved in my favourites, requires log in every few visits, may be my own fault? Either way it’s a small detail but in this world of convenience it stands out like dogs balls. Get that app going, there is a generation of new users on the way who won’t want to get they’re surf forecasting on an obsolete platform. Of course you would be aware of that!